Chas Smith is fascinated by the sensation of tone. His early work was based around the sound of the pedal steel guitar and the innovative performance methods he developed. 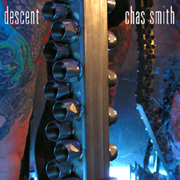 Smith's CD Descent (48'37") expands on these ideas in a deep meditation into the nature of timbre. To create his unique compositions, Smith arranges the sonic emissions of a number of unusual instruments and objects into compelling aural atmospheres. The overall sense of vibration achieved on Descent comes from the use of various metallic materials, which are stroked, shaken or otherwise coaxed to produce a range of rumbling, shimmering emanations. These forms constantly migrate throughout the soundfield and occasionally slip out of conventional tunings to explore the musical no man's land between intervals. Smith must have acquired this propensity while observing the vibration of sheet metal as a cello bow is set to it. The resulting howl takes several minutes to fully sound out during which its amplitude and character fluctuates in most interesting ways. But to merely list the source material does not justify the gravity of the listening experience. Descent is an album of Ambient Music that rings with the density of metal, tempered by Smith's ever-present ingenuity and artistry.